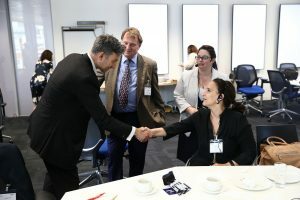 Atos UK and Ireland had the honour of hosting the Vice President of Argentina Gabriela Michetti on 25 July 2018 at our central London headquarters, as part of her visit to attend the first Global Disability Summit held in London. The Argentinian delegation, comprising diplomats and policy experts, sought to learn about our experience delivering greater accessibility to people with disabilities. Some of the tools introduced to our visitors included the Cambridge simulation kit and an immersive simulation using virtual reality, and the Worldline Hear2Pay accessible Point of Sale. Delegates also learned about our Atos Adapt network and our Accessibility Academy. The visit demonstrated Atos’ commitment to accessibility for the disabled and to raising awareness around this important issue. Vice President Gabriela Michetti was hosted by Neil Milliken, Head of Accessibility & Digital Inclusion, UK and Ireland and Adrian Gregory, CEO.